As summer draws to a close we think about what might make our gardens even better for next year and the need for privacy, security and screening is a good place to start. The key decision when considering boundaries is whether you need a solid and secure barrier or more of a visual marker to deter casual wandering. Frequently back gardens need security and privacy whereas front garden boundaries, and internal divisions, are more visual. Solid fences and hedges have obvious benefits but can leave you with a long solid dark mass which dominates the space; evergreen hedges no more attractive than a fence. The answer may be a combination of the two as in the photograph or simply planting shrubs and climbers in front of a fence chosen for attractive leaves and a range of flowering times. 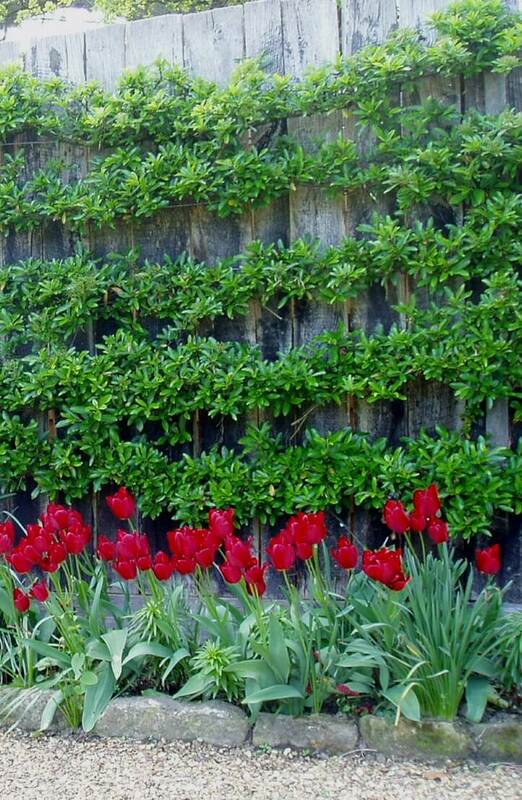 Another option is to have a lower solid fence, for example 1.2m tall, with trellis on top supporting climbers that will provide additional screening without becoming oppressive. This can be a neat solution for a back garden where trellis can provide greater privacy near the house while the fence itself is adequate at the bottom of the garden. Individual trees and tall shrubs are useful not only to give height and interest but also, if carefully positioned, to screen out telegraph poles and windows of nearby houses, reducing the feeling of being overlooked without having hugely tall fences or hedges all round. Remember that the closer the tree is to where you sit the shorter it can be while still blocking out a tall building etc. One last point especially for front gardens is to check for restrictions on fences and walls; some areas have limitations specified in the original planning permission to keep an ‘open plan’ appearance.